I’ve made the matcha spritz cookies dozens of times, but for some reason, I never thought to work from a different butter cookie base recipe until now. 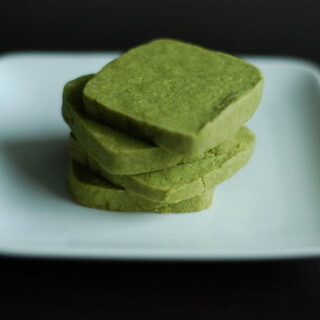 I started with a basic icebox recipe from Martha Stewart’s archives, and added my standard tablespoon of matcha, and voilà: it’s a completely different cookie. Coincidentally, Tim and I recently had a conversation about the important role refrigerators play in our life. I remember going to a student’s apartment in China where the kitchen didn’t have a fridge. They didn’t cook much because it’s extremely hard to with that kind of limitation, but also because cheap (and great!) food was plentiful on every corner of every street. Well, I am grateful for my fridge and that it’s advanced far from the old icebox. Technically, these cookies should be called Refrigerator Cookies, but I guess it’s just one of those things that are still named after obsolete technology. Like a stock ticker. Wow, that’s the best I could come up with, but I know there are other things we still call by their obsolete origins. Help? 1. Sift together flour, confectioners’ sugar, matcha and salt in a large bowl. 2. Use food processor or hands to mix butter into flour mixture until mixture is the texture of coarse meal. 4. Divide dough in half; form into two 2-inch square logs, each approximately 5 1/2 inches long. Wrap logs in waxed paper; refrigerate until firm, at least 2 hours. You may also freeze dough up to 2 months. 5. Preheat oven to 350 degrees. Slice dough crosswise, 3/16 inch thick; carefully transfer slices to baking sheets. 6. Bake until edges are firm (not brown), 10 to 15 minutes. Cool 1 to 2 minutes on baking sheets; cool completely on a rack. this is not an obsolete term, but it is an obsolete sound. you know how a lot of digital cameras have the sound effect of the shutter of a normal film camera? it serves no purpose except to make the digital camera sound more camera-like. you should make an match icebox cake!!!! when i was in france, our dormrooms didn’t have fridges, so we followed the other french students and hung a rack outside our windows in the winter to store milk and other foods there. we ended up buying our things fresh daily when we could, which took more effort, but definitely tasted better. the french take their food very seriously. i'm definitely going to try this once the weather cools off – thanks for the recipe!